By default when someone visits your Blogger site through Smartphones or tablets it automatically displays the full desktop version of your website, instead of showing the mobile responsive template. The full desktop version is not designed for portable devices like smartphones, iPad and tablets so they eat more memory, and hence not only reduce the speed of your site but also interrupts user-friendly experience. Fortunately, Blogger offers some free-to-use built-in mobile responsive templates that do the job quite brilliantly. 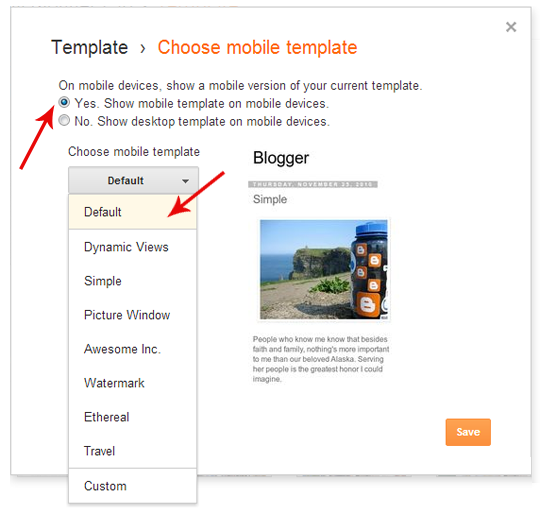 Therefore, today in this article, we will show you How to Enable Mobile Template in Blogger. Why to use Mobile Responsive Template? Probably your website is getting all of its traffic from mobile devices. In this situation, tracking the operating system of your visitors through Google analytics comes handy because if 90% of your audience is access your site through portable devices, then it is extremely crucial to enable a Mobile template for your site. On the other hand, if hardly 5% visitors are accessing your site through Mobile devices, then in this scenario there is no need to use a responsive template especially for mobile devices because the majority of users are arriving on your site through desktops. Go to Blogger.com >> Template >> Mobile >> Select the wheel as shown in the screenshot below and it will take you to a new page from where you would enable the responsive template for mobile users. Now just select “Yes. 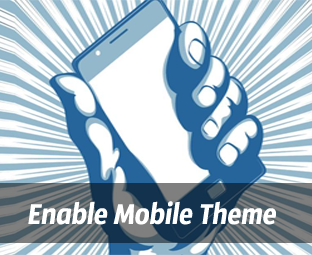 Show mobile template on mobile devices”. It entirely depends on a person what template he wanted to choose. Luckily, Blogger also provides a variety of different templates. Through the drop down list, you can select from 8 different templates according to your needs. After selecting a theme, you would surely desire to preview what your visitors would see whenever they visit your site through their phones. Select the orange “Preview” button and it will exactly display your site as you are navigation it from portable device. After previewing the themes if it satisfies your needs then, go ahead and press the orange “Save” button to conclude. Now whenever, visitors will try to access your site through portable devices i.e. Smartphones or tablets it will automatically show them a mobile responsive version of your website. What Mobile Users Would See? Those visitors who arrive on your blog through Desktops (PC, laptops, Mac Books and etc) would not notice anything different. The website would continue to behave the way it used to be. However, those Readers who will access your site through Smartphones or tablets would see a different view. Following are the list of things that would not appear in the mobile version. It will not display any gadgets. There is no Navigation Menu. On the homepage it will display Post Title, a Small Thumbnail and Post Summary with a read more button. At the bottom of the page, there are few navigation buttons for older/newer posts. In the footer, there is a link i.e. "view web version" which will allow mobile users to view the full desktop version of a website within their portable devices. However, on reloading the page, it will revert back to the mobile version. How Should I Test Site in case I don’t have Mobile? Most of the users don’t have portable devices like the iPhone or iPad, so how they will test their theme? However, blogger gives them the opportunity to view the Mobile template on their Desktops. Just visit http://www.mybloggerlab.com/?m=1 (Replace mybloggerlab with your domain). IF anyone of you is going to use this approach, then it is significant to resize your browser up to 300px, so it may display the content in a systematic order. However, for different size desktop resize the screen as per the needs. I use dudamobile site for mobile device. that's great looking. There's even an option to 'Preview' in mobile window itself. And /?m=1 would display mobile version in too big screen, so its better to Preview through blogger. And can you please tell how to design mobile template for wordpress for free? You can Use This guide because it works perfectly on WordPress too. Yeah they are enabled by default but people don't know how to change themes and etc. And can you please tell how to design mobile template for wordpress for free? Bro my question is related to " Author Image next to Google Search Engine"
just only tell me that you have only added this rel="me" with your name in your about me page. thats is. And then shows your image in search engine. you have added this rel="me" or rel="author" to any other where in your blog. Mera matlab hai ke apne sirft ye rel="me" se apna image search engine may show kia hai..
ya apne wo rel="author" wagera bi kahi par insert kia hai..
reply me i wlll soon back...please please... awer kitne din lagte hai image show hone may. Verify your site on your Google Plus profile. Add a link as contributor from Google Plus>> About. For more help you can email me.